Gilling Castle is a grade I listed building near the village of Gilling East, in the Howardian Hills. It is situated 5 miles to the north of Helmsley Castle and 7 miles south-west of Crayke Castle. The castle was originally the home of the Etton family, who arrived there at the end of the twelfth century. Thomas de Etton built a complex fortified manor house on the site in the fourtenth century, the basement of this strructure still forms the core of the present building. In 1349 Thomas' father had bequeathed the manor of Gilling to his wife's family, the Fairfaxes, in the event of the failure of the Ettons to produce a male heir. Thereby, Thomas Fairfax was able to claim the property in 1489. His great-grandson, Sir William Fairfax, who succeeded in 1571, began the rebuilding of the old fourteenth century house. Building on top of the medieval walls and leaving the ground floor intact, he reconstructed the first and second floors, adding a staircase turret and an oriel window at the back. The Great Chamber also dates from this time. 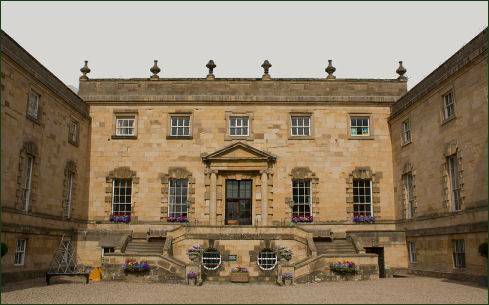 In the early eighteenth century the then owner, Viscount Fairfax of Emley, remodelled much of the interior of the building and added the wings enclosing the front court. Minor alterations were made in the 1750s by John Carr, who was employed to remodel the interior of the prominent Fairfax seat in York, Fairfax House, in Castlegate. On the death of Mrs Barnes nee Lavinia Fairfax in 1885, this branch of the family became extinct and the castle, after passing through the ownership of several hands, was bought by Ampleforth Abbey in 1929. At the time of the sale the interior panelling and glass from the Great Chamber were sold separately It was only in 1952 that the fittings were re-purchased and restored to Gilling. Today, the castle is home to St Martin's Ampleforth, the prep school for Ampleforth College. The Great Chamber, the main room of the house, is wainscoted in English oak. The chimneypiece bears the Fairfax arms in the centre panel. Above are displayed the arms of Queen Elizabeth I. 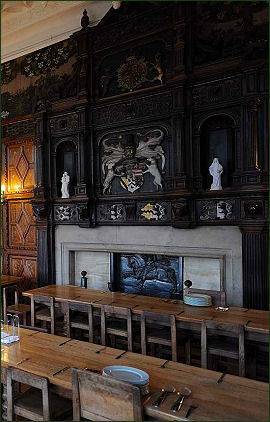 The chimney breast above the fireplace has four coats of arms, those of Sir William's four sisters and their husbands. Above the wainscoting is a frieze, painted on boards, displaying the arms of the gentlemen of Yorkshire. The heraldic decoration is continued in the painted glass, which is the finest part of the Great Chamber. The south window, which alone survives almost intact, is devoted to the heraldry and genealogy of the Stapleton family. The bay window was reglazed with clear glass, probably in the eighteenth century. This window depicts the story of the Fairfax family. The ribbed plaster ceiling with its fans and pendants completed the room. Gilling Castle also has a terraced garden and landscape setting. The gardens surrounding the house cover around 30 hectares. There is also a further 390 hectares of former parkland to the south west of the house.